Why are our politicians and decision makers unable to relate increasing electricity prices to agricultural productivity and the cost of food? While Queensland’s food and fibre policy talks up the opportunities of increasing productivity, concepts around the application of water, electricity and energy don’t appear once. Queensland farmers, particularly irrigators, are painfully aware of the elimination of irrigation and small business tariffs from 2020 – forcing them on to costly demand/time of use tariffs. Yet farming systems, water licences and irrigation equipment are, and for now will continue to be, designed around current tariffs. These changes are going to be costly, and in some cases, require expensive farm redesigns to accommodate the new tariffs. Current electricity pricing policy allows networks to burden customers by passing on the costs of inefficient and, in some cases, redundant infrastructure investments. These costs are forcing many irrigators to go off grid, with diesel power often the most affordable immediate option. Many questions still exist around whether the design of the new tariffs encourages energy efficiency or reduces network congestion to assist with managing demand for future network investment. An independent report commissioned by Queensland Farmers’ Federation (QFF) member CANEGROWERS (the ‘Sapere Report’), concluded that the design of the proposed ‘cost-reflective’ tariffs were inefficient and do not avoid network congestion. 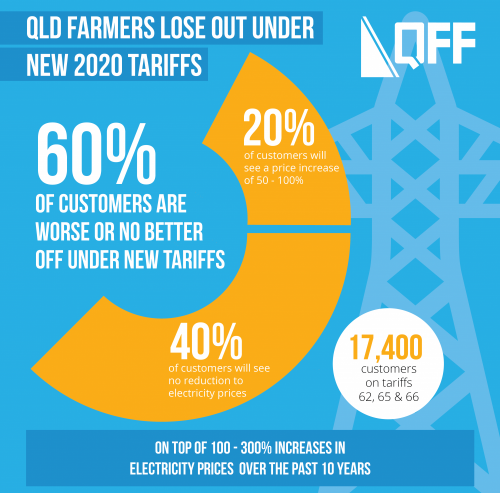 QFF recognises that we need a suite of appropriate tariffs which meet the need of food, fibre, fuel and foliage producers – a ‘4F Tariff’ – tailored to the unique needs of producers and built on regional electricity policy frameworks. These tariffs will need to drive efficient end of network demand and avoid electricity users moving off the grid which will compound the issue of declining network utilisation. So what could a suite of 4F Tariffs look like? QFF alongside industry members and in association with Ergon are considering future tariff options to suit the needs of primary producers, particularly irrigators, through a limited trial of a controlled load tariff and a demand tariff. The Energy Savers Program, funded by the Queensland Government and delivered by the Queensland Farmers’ Federation (QFF) in partnership with Ergon, is assisting farmers to reduce energy costs by supporting the adoption of improvements in on-farm energy use. Over 130 audits of irrigation and on-farm processing systems are being conducted throughout Queensland to assist farmers to identify suitable energy efficiency and renewable energy opportunities. To date, the audits have identified a range of opportunities to reduce energy costs, with almost $3 million of annual energy cost savings identified in projects with payback periods of 5 years or less. Recommendations for irrigation have included reducing friction losses in irrigation pipes, replacing oversized or inefficient motors and pumps, and adding variable speed drives where pumps have multiple duties. On-farm processing opportunities include maintaining coldroom doors and seals, solar water heating, ventilation efficiency in intensive animal industries, upgrading or consolidating refrigeration systems, and solar photovoltaic (PV) power systems. A Mareeba banana farm is reducing the irrigation costs on one pump serving 11 blocks by almost $40,000 per year with the addition of a variable speed drive and a tariff change recommended in the audit. As an added bonus, they are achieving more consistent watering and expect reduced maintenance costs. A Brisbane nursery is reducing energy consumption by 45% to 70 megawatt hours per year after installing a solar water heating system, a new smaller variable speed pump and LED lighting. This has realised $12,000 in annual electricity cost savings, recouping their investment within a year; and the ability to deliver a more consistent product through more even watering. The results are showing that as well as energy savings, farmers are seeing benefits through better irrigation efficiency, lower maintenance costs and even some time savings. QFF and Ergon are assisting farmers with implementation advice after the audits, with over 54% having implemented some findings or indicating an intention to implement, with this number expected to grow as the program continues. tariff reform to ensure that agricultural businesses are rewarded with proportionate cost savings where energy efficiencies are made. For more information on Energy Savers including case studies visit the QFF website. The Queensland Government’s Powering Queensland Plan and the Finkel Review have recently recommended additional layers of governance to coordinate national electricity market (NEM) planning. For Queensland, this includes an Energy Security Taskforce; nationally an Energy Security Board. QFF contends that these functions should be core to the remit of existing bodies and suggests that the energy markets need an ‘innovation boost’ rather than additional layers of governance. The energy sector has and continues to undergo technological disruption, both in physical technologies for the generation, storage and use of power; and in ‘soft’ technologies to monitor, manage and securely trade power. New technologies and business models offer cheap, reliable energy and are encouraging regional customers to consider going off-grid. The challenge for the NEM is to adapt quickly to accommodate these new technologies to retain and attract customers. Indeed, without better incentives, the CSIRO and Energy Networks Australia (ENA) predict 10% of customers are likely to leave the grid by 2050. Grid utilisation will continue to decline leading to further regulatory intervention, higher costs and the grid’s ‘death spiral’. encouraging strategic deployment of renewable generation to provide energy at least cost. 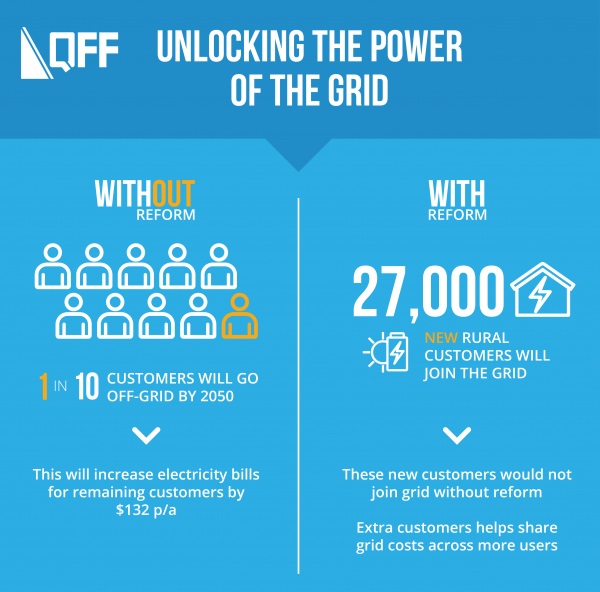 The current grid model is competing against a range of technologies that enable consumers to cost-effectively opt-out of grid-supplied power. The market needs to move to a customer-driven model allowing consumers to interact directly with the network rather than the current supplier-customer model. Technology already exists to allow electricity to be securely traded through a genuine net-metered or peer-to-peer trading model. Trading power between nearby sites while paying only for ‘local network use’ may increase grid utilisation and stability, as customers install optimum generation and storage across their sites rather than overcapitalising in plant at individual sites to meet off-grid requirements. It can also offer new network revenue opportunities while encouraging customers to stay grid connected. This technology would be beneficial for farms with multiple network connections where renewables can be connected to the main account and generation credited against consumption at multiple pump connections for example. It would also allow sugar mills and intensive animal industries to generate energy from a central bioenergy plant and supply excess power to nearby farms. QFF is calling for new policy and regulatory frameworks that allow communities to benefit from technological change, giving customers choice and allowing affordable integration of new technologies. Queensland’s electricity prices doubled between 2007-08 and 2013-14, predominantly driven by increases in network charges which increased six-fold from 2004-05 to 2014-15; accounting for over 95% of the total electricity price increases during the period. Network charges now account for over half of Queensland’s retail electricity prices. In 2004-05, they only accounted for around 20%. By contrast, generation and retail costs remained relatively stable over that period – but even that is now changing. In the last two years, Queensland’s average wholesale prices have doubled from $52/MWh to $95/MWh, resulting in the second highest average wholesale prices in the National Electricity Market. Governments do not have a good record forecasting these market changes. In 2016, Queensland’s Productivity Commission review failed to predict these increases, assuming only a 2.1% increase to wholesale prices, rather than the actual 40% increase. 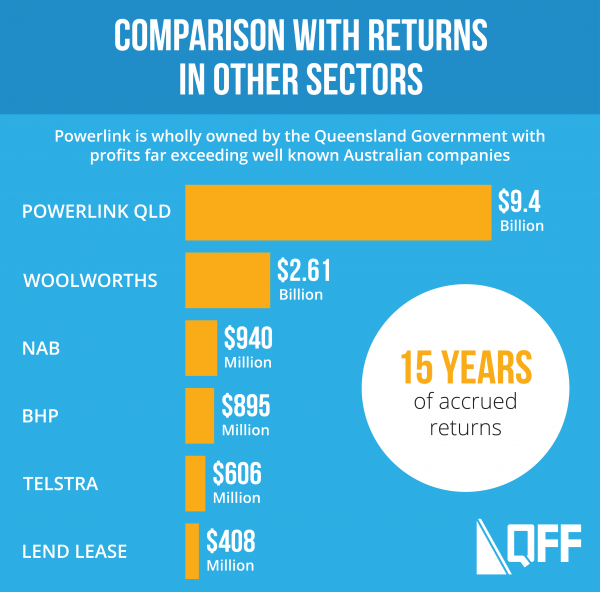 Our electricity networks are amazingly profitable, realising significant returns that outstrip private corporations and generate a hidden tax for the government. By contrast, profitability for many businesses across Queensland is being challenged, frequently as a direct result of spiralling electricity costs. According to the Australian Energy Regulator (AER), 556 small businesses disconnected in the ‘Ergon area’ alone during the first three quarters of 2016-17. This is on track to more than double the 384 disconnections recorded in 2015-16. In response to these price increases, farming businesses have been installing energy efficiency measures and renewable energy, and in many cases simply reducing demand. However, energy efficiency gains have been diminished by the increasing costs while demand reduction has also come at a cost – reduced productivity through to farmers simply choosing not to plant a new crop. Many farmers are now weighing-up options to leave the grid, taking opportunities in advancing technologies and their reducing costs. However, due to irrigation demands, through to the need for continuous power to refrigerate produce, many are looking at hybrids of renewables and new diesel generation. While diesel presents an attractive picture now given its value and reliability, there is future uncertainty on how diesel may be impacted by Australia’s obligation to manage carbon. Not to mention where this leaves consumers who are unable to leave the grid. The price of uncertainty on agricultural businesses is damaging the sector and the current ‘business as usual’ approach is unsustainable. Queensland’s electricity prices must be set at an efficient level now to promote business growth and employment, and to protect the value in existing electricity generation and network assets.